André Messager, composer, pianist, organist and conductor was born in Montluçon, Allier on December 30, 1853 and died February 24, 1929 in Paris, France. He studied in Paris with Gabriel Fauré (1845-1924) and Camile Saint-Saëns (1835-1921), both of whom eventually became good friends. Messager is known as a composer of light music. He composed several (23) Operas & Operettas, Ballets (10), one Symphony and numerous pieces for piano. 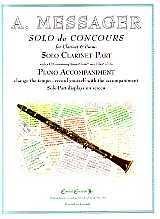 Solo de Concours (Contest Piece in English) was written in 1899.